This post is one of my favorites from the archives. I just took some additional photos for it so I thought I’d give it a proper repost to show off its new snaps. 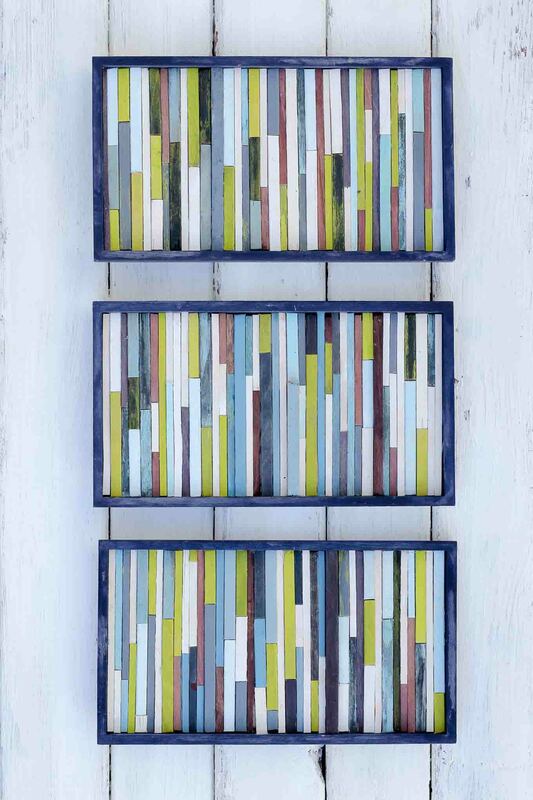 You can find lots more affordable DIY art ideas here. I’m big on projects that anyone can do. And this is one of those projects. 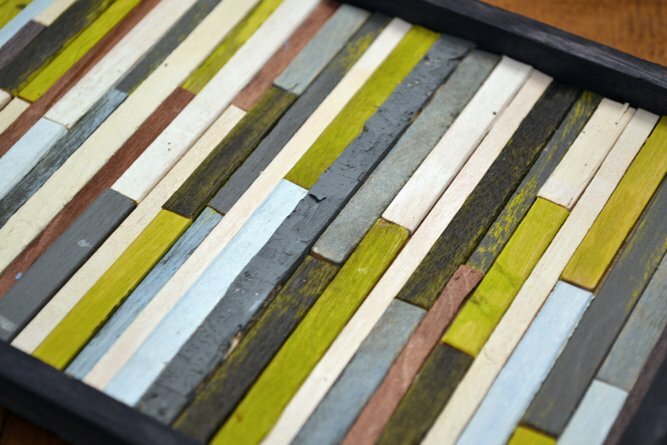 If you can smear paint on wood and use scissors, you can make this easy “reclaimed wood” DIY wall art. All in, this project costs less than $7. That’s a lot of eye candy bang for your buck. And how do we ensure we get this awesome organic woody texture? Coffee stirrers. Yup, you heard me, coffee stirrers. 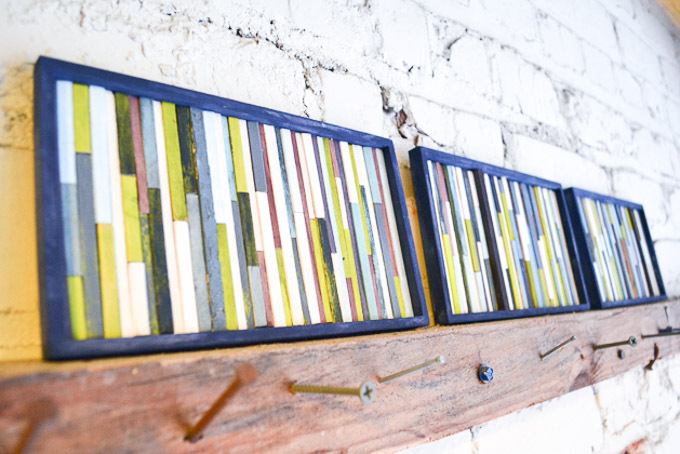 • Wooden frame(s). We got these at Michael’s in the wood section for $1.49 each. (Talk about a cheap frame!) I used three for my project. 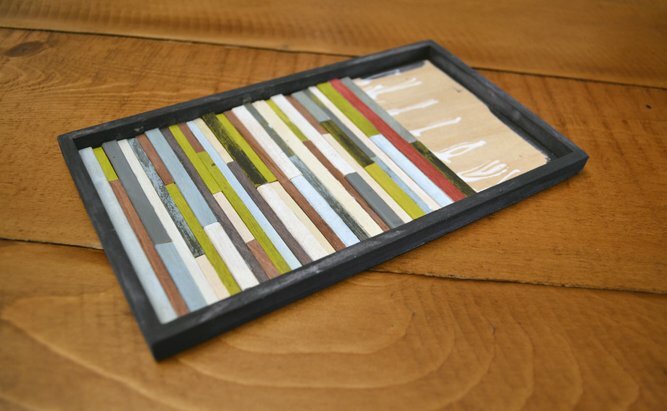 You could also use a normal picture frame and remove the glass to let all your great woody texture show. • Coffee stirrers. (“Borrow” them from Starbucks!) I also got some extra wooden sticks from Walmart for $3 that were a slightly different width to add extra texture and dimension. I’ve seen LOTS of wooden sticks of varying sizes at Hobby Lobby too. • Glue. Tacky glue. Elmer’s Glue. Whatev. • A picture hanger (optional). Okay, first things first. Choose a color palette. Doing this first, before I crack the first bottle of paint, always helps reduce my hemming and hawing during the creative process. (I’m quite an slippery noodle when it comes to decision making.) 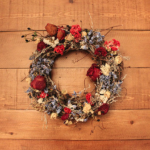 If you need color palette ideas, I suggest checking out Colour Lovers. It’s a great resource for color combo inspiration and an easy way to create your own palette. I selected colors that are fairly similar in tone because I wanted the overall look to be a bit subtle. 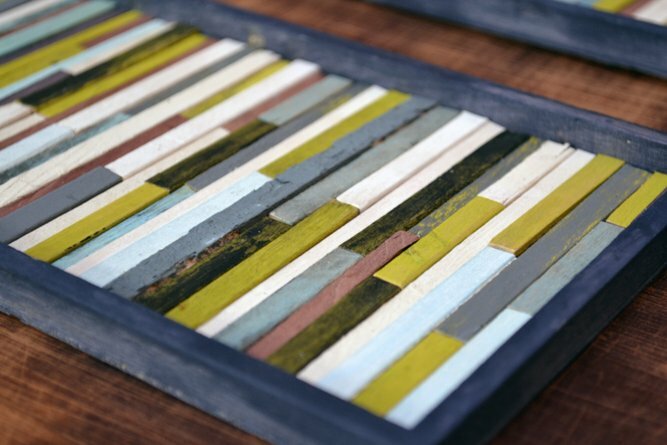 So, once you’ve got your palette, it’s time to paint your frames and your coffee stirrers! I just sort of guessed how many sticks I needed in total and I ended up needing to paint more which was kind of annoying. I’d suggest painting more than you think you’ll need. Coffee stirrers are basically free anyhow. My mom and I made this project together. 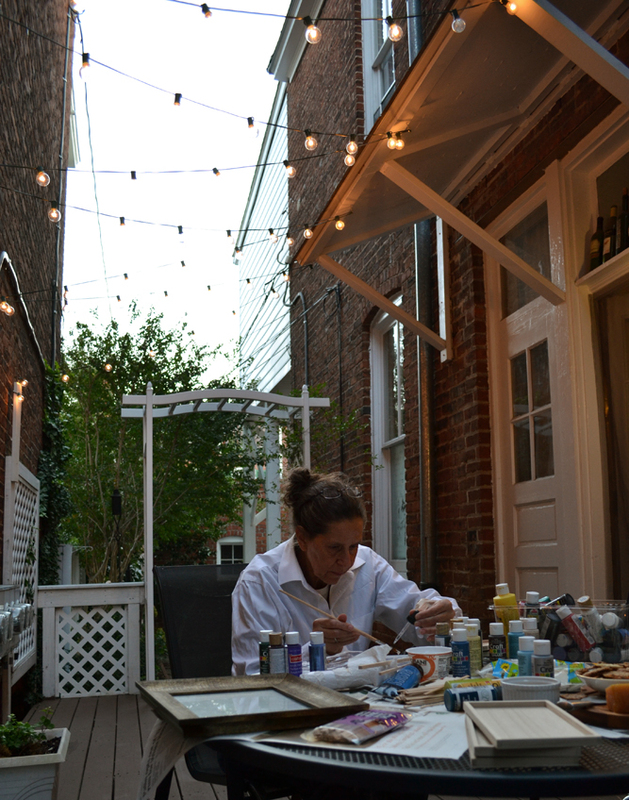 We did our painting as the sun was setting, which is always a questionable decision. Seems to have turned out okay. To achieve this look, I developed a simple, very unscientific technique. I’d paint the a brighter color (say, pea green) and then let it dry. Then I’d paint a second coat of a 50/50 mix of black paint and water. I’d let it sit for about a minute and then I’d go to think sink and rinse off some of the black paint, exposing the “weathered” green wood underneath. 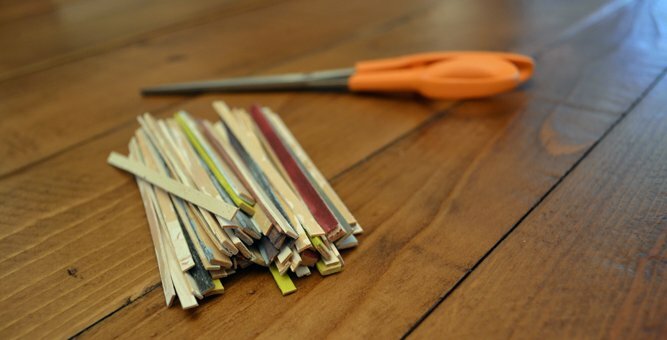 Once your coffee stirrers are painted, it’s time to trim them to fit into the frame(s) you’ve chosen. This next part is fun because you’ll start to see your piece come together fairly quickly. 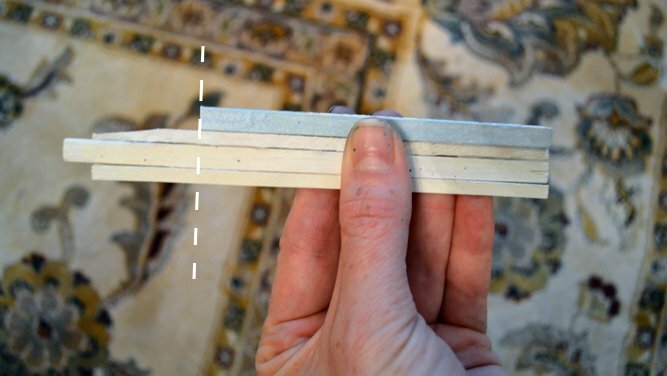 Starting on one side of the frame, put down plenty of glue and begin laying your sticks down. I used some sticks at their full length and then I also combined multiple pieces to create more of a patchwork effect. The key when combining them is to use sticks that are the same width so that you aren’t left with awkward gaps in between the vertical rows. After I finished the set of three, I realized I didn’t like the red splashes of color. Nothing a little butter knife couldn’t pry out. Since the “frames” I used were really just very thin wooden boxes, I needed to add hanging device to the back. Unfortunately the picture hanging thing came with nails that were made for elf hands. What’s left? Plop those puppies on the wall. Voila! 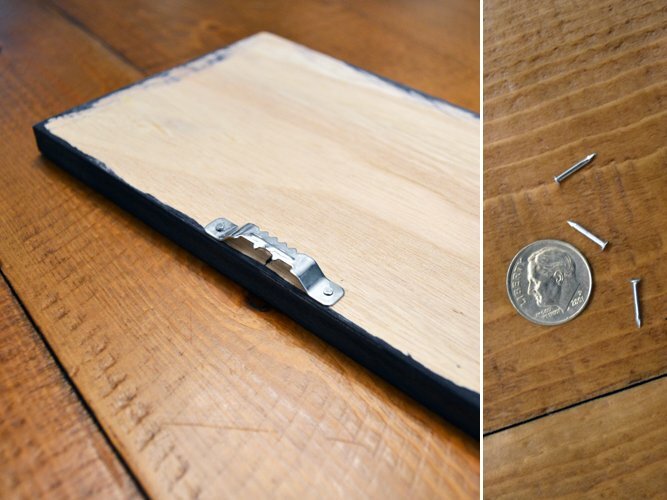 DIY wall art that cost less than $7 total. There are lots of cool things you can do with these sticks, from placing them in the frame at an angle, or even cutting the “seams” between the sticks at angles. There’s no wrong way to do it. And as far as I can tell, there’s no shortage of coffee stirrers either, so go ahead and get crazy! 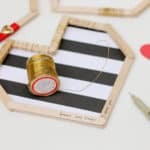 DIY Button Art Tutorial – Perfect for nurseries or playrooms! I love this idea, so clever! 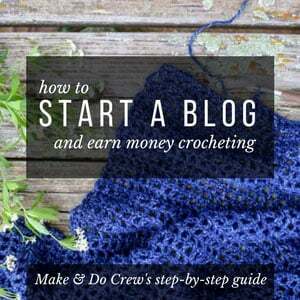 Found you on DIY linky and glad of that, will check your blog out! 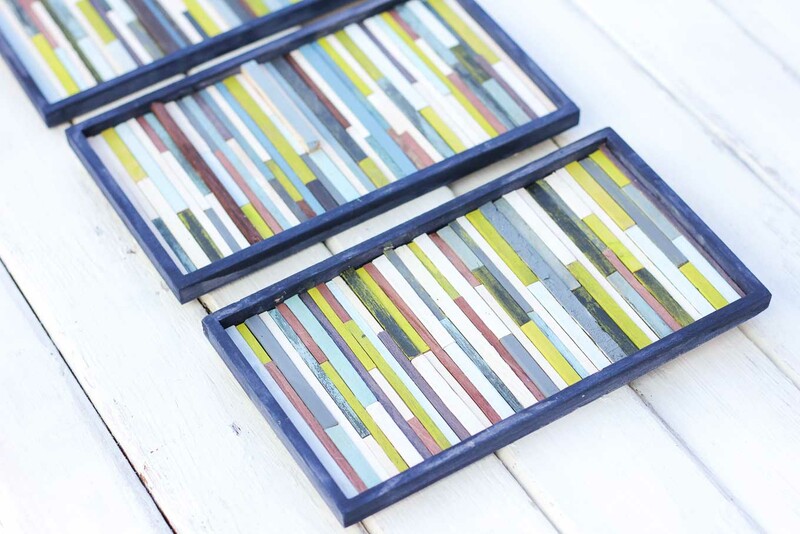 I have been wanting to do this with some wood scraps I have, it is on the TO DO LIST! Thanks for sharing and it’s so nice that you were working with Mom! Oh my. I just saw the version of this that Little Miss Momma’s Momma did, and I love both of them a LOT. You are brilliant. This is so creative and unique! Thanks Elise! You should give it a shot! hey! how ironic! i just picked up a handful of these coffee stirrers and shoved them in my already messy purse thinking they’d be cool for SOMETHING… WHAT A GREAT IDEA! Oh and, I pulled one out at McGuckins one time to sign a check. Barbara Baumgarten was with me and cracked up. Love the pictures with your Mom. You guys look “natural” doing all that stuff. Love you. The key to those tiny “elf hand” nails for the hanger is to hold them straight up with needlenose pliers while hammering them in. This is a great crafty idea! Great tip, Liana! Another good reason I need to wear a tool belt at all times. absolutely lovely. a great cloudy day project. i love painting and creating beautiful things with just objects that are sitting around. Thanks, Katie! I agree about using everyday objects. Often those are my favorite projects. Thanks for stopping by. What a neat idea! Your work is lovely. Oh wow this is beautiful! I love the colors and the look. Gorgeous. I saw this on the Craftzine blog and had to come over. i have some of these sticks from a craft store & think I may need to start “borrowing” more from the coffee shop. Sorry for being an old fuddy-duddy, but “borrowing” 100 coffee stirrers from your local coffee shop sounds awfully close to stealing. Just buy a box at the grocery store – then the only “guilt” on your otherwise cute & frugal project need be the gold (gilt) variety! Such a creative idea! Would have never thought of it myself! Thanks for the inspiration. I saw this the other day and just made one to match our new bathroom set! I love it and its so easy and fun. I bet it’s great in a bathroom. Sounds fun! Love the idea, but the thought of wasting all that new wood makes me cringe. Thousands of trees are cut down to make those silly little things. I save them to re-use, but now will save for art. It may take a while to collect enough used stirrers, but my conscience will be happy. 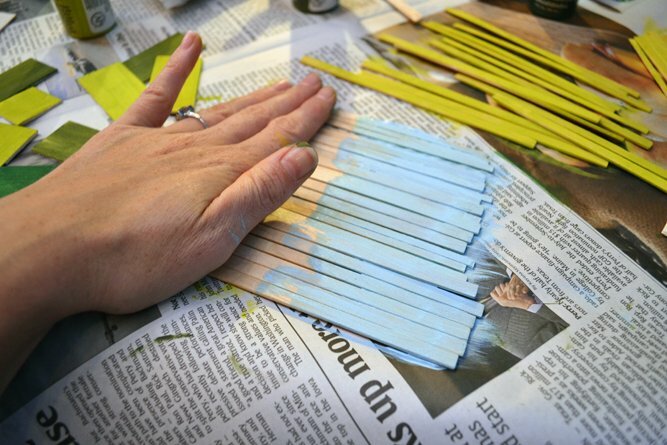 Very creative idea .. wonder if I can do the same with the bundles of popsicle sticks that I bought from Michael’s? Wow, this looks gorgeous! I may make this sometime soon, thank you! Perfect idea for my grandgirls over spring break next week! Oh sounds great, Cindy. Have fun with them! Love how this turned out, love your color palette, and especially love that you did this with your Mom! I haven’t “borrowed” coffee stirrers from Starbucks, but I have saved most of the ones I’ve used. Did you see that Starbucks have those green plastic stirrers now? Well, I keep those too because they have the little Starbucks design on top and I use these stirrers as embellishments in my scrapbooking. Awesome! Good luck with it! I love this idea! I went to Michael’s today to get the supplies, but couldn’t find those wonderful wooden frames anywhere! I looked all through the wood section, and frames. I might hit up another local Michael’s later in the week. Any idea for an alternative frame? I tried looking for the wooden frame at michaels with no luck. Also looked at Joann’s, have any other ideas of where I can find a frame! I love this art project! congratulations! nice pictures, nice work…nice mommy! Thanks Tata! I am pretty lucky to have one cool, crafty mom! These are ideas are cool, I wish I came up with them. This was such a great idea! We just bought our first house and I’m finding new and inexpensive ways to decorate. My first attempt at this was with popsticle sticks from Michael’s- it was late and I didn’t have the energy to make a coffee stop. It came out well but I’ll definitely use coffee stirrers next time- popsticle sticks are rounded at the ends- duh! Made fitting them neatly into the frame a little tough. We have very high ceilings and huge walls to cover so I’m toying with the idea of using a huge frame and getting real wood (from the Home Depot scraps bin after they’ve made some cuts) to enlarge this- what do you think?! Congrats on the new house! I love the idea of larger versions of these. 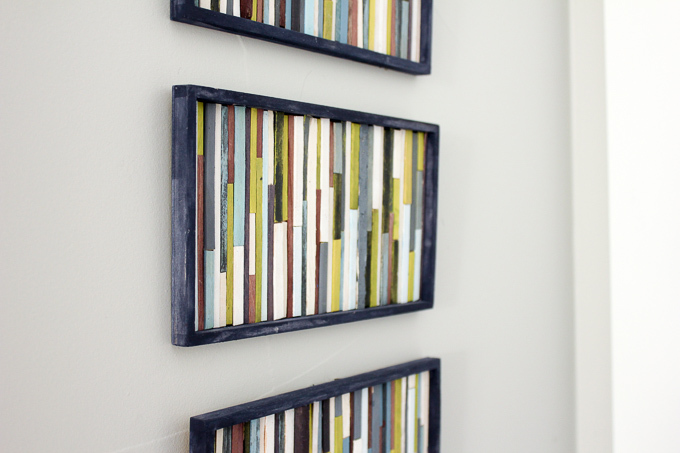 In fact, my sister in-law used this tutorial to make some wall art out of paint stir sticks and it turned out really beautiful. She just sawed off the little indented “handle” part of the stick so that they looked like giant coffee stirrers. I might post more about the idea soon. I’d love to see pics if you do make a larger version! I’m making a set of these and my stirrers are warping a bit when I try to glue them on the board. Any suggestions for keeping them flat? Mine warped a bit too and I thought it added to the “worn in” style I was going for. But is your paint or glue really wet? Extra moisture might contribute to more warping. If they’re warped even before you glue them on, you could press them in a really thick book for a few days before you glue them down. My frames are about 4-5″ x 8″. Any size would work though since you’re cutting the sticks to fit the frame. I found these in the “wood” section at Michael’s (where they have unfinished wood birdhouses, beads and other unfinished wood stuff.) 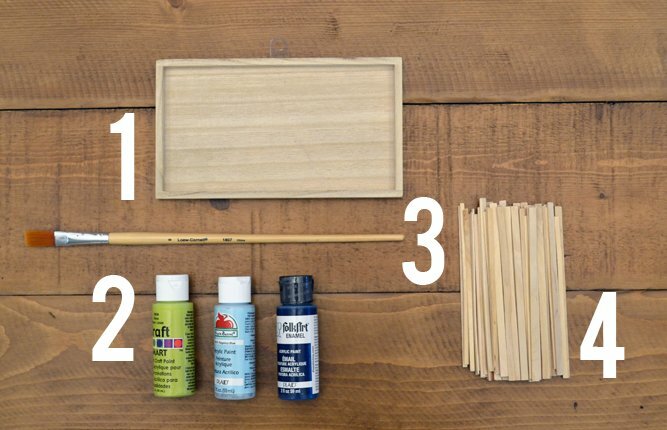 You could always use a regular frame (with or without the glass) and glue your sticks to the piece of cardboard/wood that fits in the back of the frame. Surprisingly simple yet good looking piece of wall art there! I think it’s the color scheme that makes it look as good as it does to be honest. I love to hear that this project inspired some good old-fashioned quality time with your boys! My daughter is still a little squirt, but I so look forward to the days when we can do stuff like this together. Wow! Awesome, Charlotte. I love how you re-dyed the wood to make it more muted. Looks great! Thank you for not only the fantastic inspiration, but also for the love and care you put into all your posts! Hugs . . . Thanks Dar! I appreciate the kind words. I love this! I’m just curious; what size is the frame pictured? 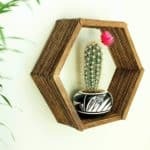 I’m having a hard time finding anything like that on the Michael’s or Hobby Lobby website but it looks like the size you used is about what I’m looking for. Thanks for your help! Nevermind! I’m sorry, I just saw that you already answered this question above. Thanks again for the craft inspiration! Glad you found your answer. I’ve recently seen some larger wood “trays” at Michael’s in the wood section that might be a good option if you want a bigger project. I LOVE THIS! My 7 year old daughter loves collecting stir sticks whenever you go into a coffee shop or a restaurant. I am constantly throwing them away. Now, I can work on an art project with her and enjoy collecting the stir sticks. Thanks for posting! Fabulous idea. Would be a perfect piece in any room. A clock! What a brilliant idea! Thank you so much for sharing. Happy crafting! Ha–it’s me! 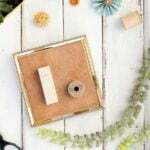 Apparently, I love to make projects from little wooden sticks 🙂 Thanks so much for pinning my posts. I really appreciate it. Your site has such a fun premise. I have always loved the combination of DIY and travel, but I never thought to share it with anyone. I’m glad you did! Thank you – and thanks for checking it out. I think there is a lot of overlap between exploring the world around you and being creative. Great idea! Might have to try this. Question: is it ok to use popsicle sticks? I have a bunch of old ones that I don’t use.